Greece's allies sent firefighters and aircraft to join the fight Sunday against the country's worst wildfires in decades. A Russian aircraft group had already been there, helping the Greeks since the end of July in their fight against fire outbreaks. The fires increased dramatically on Friday and continue to rage in many areas, killing dozens of people. The Russian group includes two heavy fire-fighting helicopters, two Mi-8 helicopters and a multifunctional amphibian plane. On Friday and Saturday, Russia said, the aircraft fought fires in the Peloponnese, the worst-hit area. The amphibian plane was used Saturday to put out a serious fire on the slope of Mt. Ymittos and in Athens suburb Papagou. France, Spain, Portugal, Norway and Italy are contributing Canadair water tank aircraft; Serbia, Germany, the Netherlands and Slovenia are sending other aircraft, and Romania and Israel are sending other assistance, Greece said. Some of the aircraft are already at work in Greece and the rest of the assistance is due to arrive soon. Austria said Sunday it would send two army helicopters, a transport plane and 20 firefighters. Sixty French firefighters specializing in helicopter missions flew to Elefsis air base near Athens early Sunday. France had already sent four Canadair planes on Saturday. French Prime Minister Francois Fillon spoke by telephone with his Greek counterpart Costas Karamanlis, assuring him on Sunday that France was prepared to send more aid if it was needed, the French premier's office said. Italy sent a Canadair fire-fighting plane to assist the Greeks, Premier Romano Prodi said Saturday, noting that Italy, too, had been fighting fires in the south. Germany said it was sending three CH-53 helicopters on Monday to support the firefighting effort. Dutch Foreign Minister Maxime Verhagen said the country would send two Cougar firefighting helicopters. Switzerland said it was sending four Superpuma helicopters to help with carrying water to douse the fires. The first, based in Kosovo with the Swiss army, is expected to arrive in Greece on Monday. Three more will leave Switzerland on Monday and are expected to arrive on Tuesday. Cyprus has already sent 30 firefighters and 29 civil defense personnel along with six fire-fighting vehicles. About 25 more firefighters who specialize in forest fires were to leave for Greece later Sunday with five vehicles. The government said it was ready to provide camp beds, blankets, medicines and medical personnel, if they were requested. 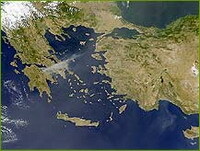 Greece had asked the European Union on Friday to request water-bombing aircraft from member nations. The EU said the response from its members has been the biggest offer of assistance to a member state since the EU set up a civil protection mechanism in 2001.